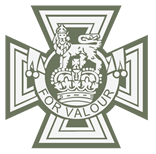 Victoria Cross recipients who were Freemasons. The Victoria Cross is the highest hounour any individual can receive in the UK honours system, and is only awarded for the acts of conspicuous gallantry and courage in the face of an enemy. To date (Apr-17), 1358 have been issued, with 3 of those issued as a bar. It is researched that 108 of those V.C.s issued were awarded to Freemasons. A source of immense pride to Freemasons everywhere and one which the research for this website could not ignore. On the 25th April 2017, at Freemasons' Hall, Great Queen Street London, was unveiled a permanent memorial to those 64 Freemasons who were awarded the Victoria Cross during the Great War under the English Constitution. Up to that date this project only revealed the 12 V.C. holders who were counted amongst the Great War casualties - 3 of whom had received their award in previous military actions. Many of those awarded the Victoria Cross survived their act of courage. A full comprehensive list cannot be published whilst some of those Freemasons survive today, so this list concentrates only on the Great War and more particularly, those under the English Constitution.